I thought the word 'petroglyph' meant 'gasoline' in Spanish. My gypsytoes have been itching for a cheap, comfortable retirement haven abroad for many years. We discovered the road less traveled eight years ago when my family helped me deliver 500 pounds of school supplies to an impoverished school in Nicaragua. My husband, Ron (which means rum in Spanish), and I jumped at a chance to live and work on Ometepe Island, Nicaragua seven years ago. Although managing a backpacker’s hostel turned out to be a big mistake, we did stay on the island.For a lack of better sense, we quit our teaching jobs, sold our cars, and gave away all of our winter clothes. Returning to the states was really not an option. We rented a little beach house and taught ESL for a year before returning to our grownup lives as teachers in Gringolandia.It was our grand experiment with ‘pretirement’. With early retirement goals in hand, we struggled for five years to become debt free and purchase the little beach house we rented for a year on the island. In the summer of 2010, we returned to Ometepe Island, this time with more knowledge and understanding of how things work…or don’t work, in Nicaragua. Please join me in our new adventures, as well as some of the old, as boomer economic refugees in Nicaragua. We are rewired and retired…life will never be the same. You have been in our thoughts since the difficulties began in Nicaragua, and I finally caught up with you through your blog. Glad you are safe, and hope that you will soon be able to return to your beautiful home on the beach. Thanks, Babs. I am writing an update, soon. Was away from “Rewired” for almost a year; busy teaching school and the after hour paperwork. Was catching up with your recent blogs, the good, the bad and the unexpected. I hope good health are with the both of you. In addition to your blog, I continued reading the many interesting comments from your readers. One comment that struck me was from a school teacher in 2012 and I could relate with her ideas. She was interested in combining a travel with teaching adventures, making the article even more interesting. By the time I read to the end, I realized that commentary written by me seven years ago! Slap in the head. I thought it was from a woman because, as it is in my school, most teachers are women. Thank you for keeping this blog alive. I will be interested in your next blog. Haha! Steve, that is so funny! I am glad you are still reading my blog.Check out my latest posts because our lives have changed drastically. Thanks for your comments. Hugs. 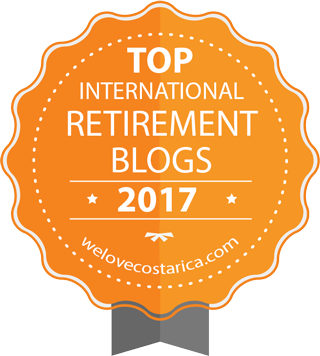 Top 30 International Retirement Blogs in 2017. Feel free to download and use it anywhere you wish! 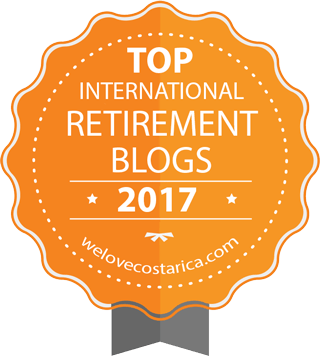 Once again, I hope your inclusion in the list drives some new readers to your blog and I look forward to staying connected! Where in Ometepe do you guys live? I´m an Austrian refugee living in Madronal always open minded for new connections!!! We live on the beach in La Paloma, close to Moyogalpa. Come visit sometime. you guys are a true inspiration to me, i’m from Nicaragua but like many Nicaraguans i’m currently living in the states for economical reasons, I do imagen sometimes live peacefully en my linda Nicaragua, I’m already planning my early retirement to Nicaragua and i’m hoping will be very soon. thank you for being kind to my people and to my LInda Nicaragua. I too am enjoying your blog. I will be visiting Ometepe Dec.2023 for a possible move to there. I am thinking Altagracia. Do you think it is noticeably cooler than say Moyogalpa? Hope I can find a reasonable rental. I have lived in Belize, Mexico & the USVI’s. Am currently in the Fl. Keys. Lewis, sorry, I just found this comment. The other side of the island gets more rain, even in the dry season. I’m not sure it’s any cooler, though, unless you climb one of the volcanoes. 🙂 Did you mean that you were visiting this year or ten years from now? I can attest to this also! My wife and step-daughter are Nics and live in Rivas, which is about a 40 minute ferry ride to Debbie’s place. Everything is poorly run there, but is still a great place to live. I send my daughter, Roxie to a pretty good private school where she is getting a pretty good education by Nicaraguan standards. She also travels a 5 hour round trip bus ride to Managua each Saturday for a three hour course in English. I will be leaving the states in late April or early May and will become an ex-pat full time. If you have anything to offer these people, and I mean anything in education, skills, etc, then you would be well accepted and much appreciated. Take care Debbie and hope to meet you soon. Hmm, I was just there on Ometepe in October for about five days. First time there and just love it! First thing I see each morning when I get up is the island and just makes my day. What a view to wake up to. Joe, wonderful comments about the need for volunteers in education here! Thanks for your input. In addition to ESL, do you see a need for teachers in Math / Science? I won’t be discourage if you say no. I have been teaching/tutoring computer science / math / science to a small 4-6 student group. I have a masters degree in software engineering which is more math than engineering. In my younger days I taught at a community college in the evenings while doing engineering in the day. Now, retired for 5 years, I teach Math / Science a few hours each week at a local private K-12 school. I’m an adjunct instructor / tutor who comes in two days of the week. I know what you mean, I give lots of “free” lessons beyond the what is scheduled by the school. The older kids sometimes email problems they get stuck in and I usually get back to them if I see the email. Can’t count how many hours questions and solutions are emailed back and forth. Of course this is in the USA where kids have internet access and cell phones. Nonetheless I completely understand the satisfaction when teacher and student share in the “discovery” during their lessons. You can’t imagine what the schools are like here. Pitiful, really. Most of the students do not go to school beyond 6th grade. Their math skills consist of counting on their fingers. There are very few classroom materials. Mainly, the teacher will write something on the blackboard, while the students copy the information into a notebook. The students only go to school a half day. There are no cafeterias, no libraries, no computers, and virtually no organized curriculum or instruction. However, things are looking up. Supposedly, every child on the island will receive a ‘One Laptop per Child’ indestructible laptop, when the new school year starts in February. I would love to be able to help train the teachers and/or the students on how to use the laptops and integrate them into whatever type of curriculum they have. I taught graduate level education classes online. Most of my students were stationed in military bases throughout the world. Virtual education is the way to go! But, Nicaragua is a country where progress is slow. Poco y poco. Everyone, who has an interest in education would be welcomed in Nicaragua. Their needs are so great. Gypsytoes – You may know me as Grandmas_go from Thorntree, but now I may be headed in your direction with two young – well they are the ages of my kids, in their 40s – colleagues from work, and I have 2 questions: 1) do you still need children’s books in Spanish? 2) can you make some suggestions as to where to stay for a couple of nights? The places we’ve come up with so far are the Finca del sol, the La Vie Verte Organic farm, the Totoco Eco-Lodge, and the Finca San Juan De la Isla. We’re looking for quiet, interaction with folks who live there, en suite bathroom, and breakfast. I’d appreciate any ideas you have, and if we can pull this off, we are looking forward to the petroglyphs and the natural beauty of your island. Thank you for visiting my blog. Yes, I’m always in search of more children’s books in Spanish. I think I will need several hundred books in order to start my mobile library. I have over one hundred books, but I’m actively seeking more donations. As far as a good place to stay, I have heard great things about the Totoco Eco-Lodge. They are completely self-sufficient. One of these days, I’m going to have to explore the other side of the island. It’s been ages since we’ve visited our friends on the Maderas side of Ometepe. When are you planning to visit? Let me know how I can help you. Thanks again for visiting. I will be bringing you some books in April. I also do a library cart–something that we take around from classroom to classroom at the school that I work at. I am an slp, and part of the deal is getting functional communication going between the kids. I see that I can get ‘lots’ of children’s books in Spanish on ebay for about $1-2 each. They are described as early readers, for the most part. So I was thinking about getting some of those, as well as picking up some at the bookstore in Granada that you mentioned. Thanks so much for offering to bring books. I am thrilled by the generosity of those who read my blog. Thanks for the tip about eBay. I never thought to look on eBay for children’s books. I hope to see you in April. Thank you for your quick reply. She is not a teacher and knows what she would need to do. I am interested in hearing about your experience in actually doing it. Did you enjoy it? What was great, what wasn’t so hot about doing it? Any unexpected issues? She only wants to teach adults, if possible. Thanx! Teaching ESL was rewarding. As a result of teaching, we became involved with many wonderful families. They invited us to weddings, graduations, birthdays, and special family celebrations. We wanted to become involved in our community, and when my Peace Corp friend’s tour of duty was over on the island, he gave me his English students to teach. We didn’t charge them for lessons…the families were very poor. But, they often brought us little treats of fruit, candy, and other things. I started with 10 high school students. They bicycled to our house 3 days a week for lessons. Then, the little ones in our neighborhood wanted to learn English, so Ron taught them ( 2-10 yrs.) using active games, dances, songs, and baseball. Word spread quickly, and before we knew it, we had 2 adult classes comprised mainly of business owners, bank clerks, waitresses, and tour guides. I made PowerPoint presentations for the HS classes and adults. We started and ended our lessons with oral conversations. By the end of a year, we taught them all Red Cross First Aid and CPR in English. My husband was a certified Red Cross Instructor….we really stressed practical ESL skills because many of the adults were tour guides and took tourists to climb our volcanoes. I tested them at the beginning and the end of their year with us to see the progression of skills. Those who started on a first grade level, progressed to a fifth grade level or beyond. I was so proud of them. At the end of a year, we had a graduation ceremony and I made them all certificates. Because we didn’t charge for the lessons, we didn’t have everyone coming on a regular basis. This made it difficult to keep up the pace of the lessons. If I were to do it again, I would charge them a little bit…even 50 cents a lesson would have provided motivation to attend regularly. I also had to individualize instruction because some learned rapidly, others slowly. It took a lot of work on my part to plan and individualize to meet their needs. Ron had his hands full with the little ones. Some days he would be outside with 20 or more kids…teaching them the hokey pokey and playing baseball with English directions and instructions. It was a hoot. One day, after class, two little girls got into a fight and pushed each other into the lake. The mothers came to our house wanting to know what happened, but we hadn’t seen the fight. After that, we restricted our lessons for the little ones to 8 students per lesson so we could keep a better handle on things. Our house became an open school. Although we tried to limit the classes to three times a week…more and more people wanted lessons…and trying to provide for them became a full-time job. We really needed a break. We didn’t care that we were volunteering, but sometimes we just needed to have some time to ourselves. Our garden was neglected…and we rarely got to travel around the country to explore. If we were to teach ESL again, we would have a location outside of our house and limit it to one or two days a week. Locating materials, books, and other supplies was also a problem. We had to provide everything. The students brought their own notebooks and pencils. We supplied everything else, crayons, books, colored paper, tape,scissors, glue, and other necessary things. Because of our experience, we became accepted into our community. Everyone knows us and we are respected as teachers, friends, and in some cases, extended family members. Just found your blog. My wife is/was interested in taking a “Teaching ESL” class. What was your experience in actually doing it? I am a retired teacher with 2 masters degrees, so I never took an ESL course to certify me as an ESL teacher. If your wife is a certified teacher in the states and wants to teach ESL abroad, she really doesn’t need to take an ESL course to teach abroad. If she is a certified teacher in the states, and wants to teach ESL in the states, she needs to get certified through a University to teach ESL. If your wife is not a teacher, has no experience teaching, and wants to teach ESL abroad, then she will definitely need to be certified for ESL. I would recommend a TEFL/TESOL training program. This website is very helpful. http://www.eslcafe.com/ I hope this helps. I am Erika from TravelerVoice, a new social network for travel bloggers. Thanks Erika. I added my blog and registered. A chill at 80 degrees? Funny, sometimes no matter what the temp. rain always gives u a chill. I also remember watching the gals in Dominica doing there laundry in the lake. I was there in 2000, it was such an experience. I luv this blog! You can almost picture all of this happening! We are in the rainy season until the end of October. Today, after a heavy rain, I actually said, “Brrrr…” It was in the low 80’s. lol Early morning is baking time, before the sunrises. I made banana bread yesterday. I’ll try to post more recipes for the cooks and bakers on my blog. I have lots of fruit with which to experiment. So glad you are here. This is so enjoyable to follow you on this blog…Look forward to the post. Where were you from in the states? North I guess if you gave up the winter clothes! Will look forward to hearing your experiences, I found you from the nicalist post. Thanks for visiting my blog. We live in an all Spanish community called La Paloma. It is located about a mile and a half south of Moyogalpa. Sometimes I think great things come from an unexpected turn….this is how I found you. Delightful reading. My husband and I have a home just outside of San Juan del Sur and have been travelling to Nicaragua since 2005. We hope one day to retire there as well…..but for now we are caught up in all the trappings of parenthood, real estate and life in general. I can’t wait for for the day when my only concern is….hmmmm which book next. Thanks for the lovely comment, Suze Q. I wish my only concern was…hmmmm which book next. LOL Instead, I am washing clothes, tending to the garden, and endlessly raking up mangoes. My Kindle is patiently waiting for me to read the next book. Next time you are in SJDS, we’ll have to get together and share some mangoes. Thanks for checking out my blog. I like yours too! I can’t imagine how wonderful it must be living on Ometepe. Thanks for leaving a comment, Marisa. Next time you visit Ometepe Island, please stop by to say hello. Chris, thanks for your comment. You know, you can always convince the wife to come for a visit. Nicaragua is a great place for a little vacation. Debbie & Ron – I am just going to love your blog, like your Facebook messages you have a wonderful way in explaining a situation that makes it meaningful and amusing at the same time. The Barbie and Ken video was a hoot! I can’t wait for the next post! Nancy, thank you so much. Actually, your blog inspired me to start one of my own. When I figure out how to make a blog roll of my favorite blogs, can I add yours to my list? I would love to be added to your blogroll. Of course I went to add yours to mine and forgot how I added the three that I already have so I need to write to the folks at WordPress — yet again and ask a stupid question. They really must think I am one dumb dame! !